Love the picture of you and John, and all the ones from Glen Eyrie. It's May 31st, 10:30 pm and still 80º. I shudder to think how bad this Summer may be. Be sure to let me know if you do the meme. I am SO proud of you. That's my salad spinner and I tell you, it's just the top of the line. I'm so glad you had a great birthday. And spring cleaning just got totally by me this year. So don't worry about that. I've decided spring cleaning is overrated. Let's start a "summer cleaning" thing, OK? That does sound like a good week! I feel sorry for the driver of that white car. I don't believe s/he's going any where any time soon, given Mr. Ram's appearance. Nothing like a summer hike under a CO cerulean blue sky. Glad your b'day was fun. You have such a great looking family and are making such awesome memories with them. I can see them now remembering how their mom kept their first week's schedule clear so they could sleep in! Is there anything sweeter? Staying up late, sleeping in, and eating cherry pie ala mode? I think not. Sounds like a great birthday! Texas Roadhouse is one of my favorite places to eat! And what a great start to summer! Sounds like a great birthday (I just had my 38th birthday in Feb.), especially the reading a good book part. I have the same salad spinner and love it. I love see all of your pictures. I can't wait until we can make it back to CO one day. It's been too long. Don't know how I missed that it was your birthday! Happy Late Birthday!!! Sounds like a perfect day in CO! great pics of glen eyrie. our sighting of the bighorns wasn't as great as yours. they were in the trees which made it hard to get pics. oh well, we're still thrilled to have seen them...the perfect way to end our trip to Co.
glad your summer is off to a great start! I love that you were able to purchase that salad spinner 'guilt-free' - that makes me happy. I just received total validation by reading this post. Since we're back from all of our trips, summer officially starts here tomorrow and I'm cleaning like crazy to get ready (my husband can't understand this logic), so I just read your sentence out loud to Eric and said, "See, it makes total sense!!" Okay - gotta go clean! The candles on your birthday cake are so cute! Very creative! Your first days of summer look wonderful. I'm jealous! :) I've heard of a new trend this summer because of gas prices. It's called a "staycation"-where you just stay close to home instead of going away somewhere. You could SO do that where you live because of all the cool things to see there in Colorado!! Those pictures have summer fun written all over them. I am glad you had a special day. I didn't get a picture though... Right after that David brought up a big king snake that Lydia saw in the woods... Nature is all around us huh? Have a blessed rest and cleaning spree! PS. I love your hair! You should see mine now. I've let all the color wash out.... I'm surprised at all the gray...but it's me.....at 50. Happy Belated B-day, Mer. I love your picture. I've only seen Big Horned Sheep at the entrance to Rocky Mt. National Park around Estes Park. Love Glen Eyrie and saw some neat eagles while I was there. Soooo fun! I have the salad spinner, too...and I love it! LOVE Texas Roadhouse! Yum!! And Sonic! You did have a good day. 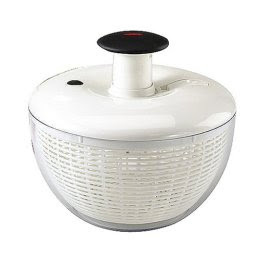 I have that exact salad spinner and it is fabulous. I prefer to buy leaf lettuce rather than iceberg. My spinner came with an addition lid so I usually spin the lettuce twice and leave it in the spinner. It stays edible for a week. That way I can use however much or little I need each day. So glad you had a great birthday. That picture with the candles WAS very creative and sweet. I need that salad spinner. Since you are thrilled with it, I might just go ahead and take the plunge. I think it would save me A LOT of time which would be worth the $$. Gorgeous pictures from your hike. You really live in a beautiful state. That place you went hiking is beautiful!!! SO neat that you can do things like that!!!! CO really is beautiful - even if it snows to much for me. ha! I'm glad you took a picture of John's book - that is SOOO neat!!!!!!! And I love that you have a summer tradition of grilling hamburgers and watching a movie with dessert. I love the things your family does! AWESOME pictures!! Happy summer to you! Ok, we so do not have sheep like that runnin' around Oklahoma. Awesome pictures! Your summer looks like it has started off perfectly! I think you will love your salad spinner. Mrs Moofish gave me one for my birthday in October and I use it All. The. Time. I love it! I too have wanted a salad spinner forever. One day soon, hopefully! Your kids are such dolls! WHAT?! I missed your birthday?! I'm so sorry. I've told you before, but I can't pick up your blog on Google Reader, so it gets sort of forgotten. :( I'm sorry. I just added a new bookmark which includes the five or so blogs that Reader doesn't Read, so now I've no excuse. The bookmark is even entitled, "READ THESE NOW". Looks like your summer has started out great! Texas Roadhouse - yum. I love the peanuts and their ribs. I am looking forward to visiting Garden's of the Gods when we are there this summer!